If the picture doesn’t show or the notes are not present please see the original on Flickr. 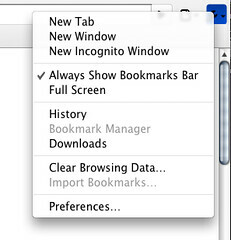 Which by the way contradicts what MG Siegler of TechCrunch wrongly stated at the end of http://www.techcrunch.com/2009/08/31/builds-of-chrome-get-updated-to-show-off-their-snow-leopard-spots/ about the bookmark manager being available on Macs. No such thing here, yet. This directory always offers the freshest automated build from the current day (which sometimes includes more than twenty builds). If you consider this tedious and you don’t want to manually download, unzip and replace your copy of the browser in /Application there are two handy scripts that can help you automatically doing that. 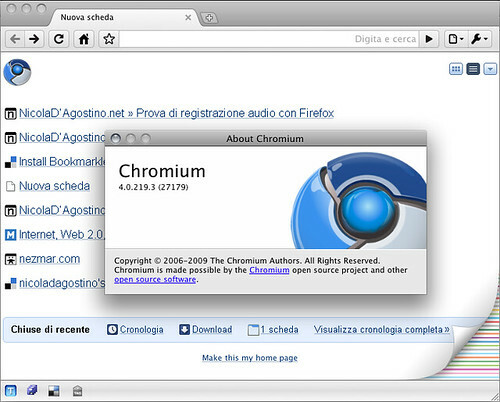 The first is Chromium Updater, an AppleScript by Dom Barnes, now at version 0.2. The second is the similarly named Chromium Updater, a faceless app done with Automator, provided by a developer working for TechCrunch. Unofficial Delicious extension for Chrome finally working on a Mac? 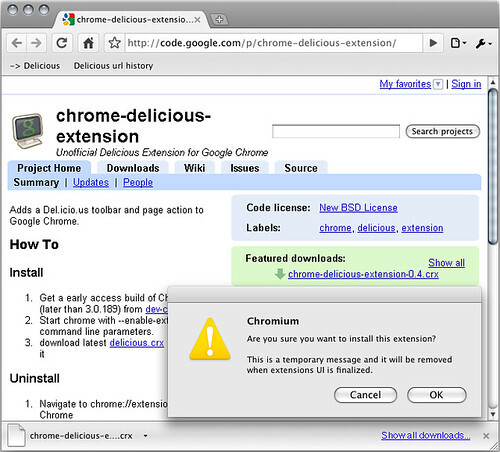 looks like I was finally able to install the Unofficial Chrome Delicious Extension on Chromium 3.0.196 for Mac. Looks like although not yet ready, bookmark editing is coming up on the Mac version of Google’s browser. This contextual menu was not present at all a couple of days ago at the beginning of July (in 3.0.192) and popped up around the 7th of the month (with (3.0.193). On the other hand there’s still no drag n dropping of links into the bookmark bar.